Parkins Plastic Machinery Co., Ltd. 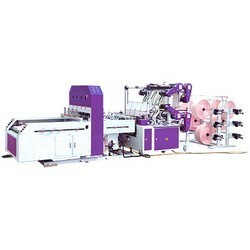 Manufacturer of Plastic Bags Making Machines. •Double layer for 8 lanes in total. •Uses servo motor for feeding, with stable sealing abilities, and fast on speed change. Easy to change bag size, and size error is permissible. •Machine stops when abnormality is detected. •Hot pin positions can be moved freely. •Able to produce flat bags and T-shirt bags. •Air cylinder punching device featuring pressure boost. Enhancing speed and accuracy. Low noise, with no oil leakage. •Enclosed with punching position calibrating plate to ensure accurate hole position on T-shirt bag handles. ※Correct specifications depend on the actual model. All specifications are subject to change without prior notice.